In your selection and purchase of a vehicle scale, you will find that they fall under a variety of regulations including state and local regulations as well as federal. 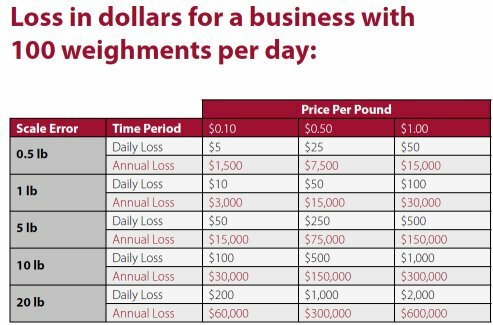 You must be cognizant of these regulations and take them into consideration when determining the total cost of the scale. Local regulations may include construction permits, zoning, setbacks, and others. Some cities and counties have their own legal metrology laws regulating the use of scales used in trade. Almost every state has a department of weights and measures that oversees the use of scales, including vehicle scales, used in commerce while several agencies of the federal government have their own set of rules for regulating the use of vehicle scales in special applications. While your local scale service company should be familiar with these regulations, it is a good idea for you to become familiar with them as well simply to provide you with the assurance that you will not be faced with an unpleasant surprise at some future date after your scale is installed. A good place to start is with a call to your local weights and measures office. If you are unable to find a local telephone number for a local department of weights and measures, you should check with listings in your capital city. Another source of information is the Internet where most state departments of weights and measures maintain a Web site. A listing of state weights and measures departments can be found on the National Conference on Weights and Measures’ Web site at www.ncwm.net. State weights and measures personnel will be happy to provide you with any requirements that are unique to your state. For example, some states have different requirements for the length, width, and slope of approaches to a scale while others may also have requirements concerning the minimum clearance beneath the scale structure. Most states will also tell you that the scale must have a NTEP Certificate of Conformance in order to be used in commerce. The next step is to call your city’s building code office to learn what requirements they have. Often, a building permit will be required for construction of the concrete foundation and approaches and for the wiring needed to power the scale. You may find that these services must be performed by contractors licensed by the city. Vehicle scales are available two basic types with variations on each type. Vehicle scales can be installed over a pit (similar to the basement of a house) or they can be installed above grade on a concrete slab. Pit type scales are often found in colder climates and offer several advantages. 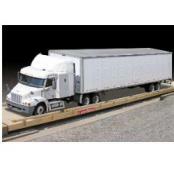 Although generally more expensive than a similar model installed above grade, a pit type scale provides easy access to the components beneath the scale and does not require ramps for the truck to pull onto the platform. Approaches to a pit type scale are much easier since the weighing platform is flush with the surface of the ground. On the other hand, a pit type scale normally requires some means of dealing with the accumulation of water within the pit whether it be a gravity drain or sump pump and are significantly more expensive to construct requiring excavation, forming, and pouring of pit walls and floor. One other thing to consider is that with a pit type scale, the truck cannot fall off the scale should the driver cut his wheels too sharp. Platform size is an important consideration because, once purchased, it is almost impossible to change the size of the platform. You must identify not only the vehicles you currently use that will be weighed but also those you may use in the future. Since a typical vehicle scale will have a life of ten years or significantly more, consideration should be given to what vehicles you will be weighing five, or seven, or ten years from now. Vehicle scales typically come in widths of 10, 11, 12, and 14 feet or even wider. Lengths range from 20 feet or so to over 200 feet. Of course, as the size increases, so does the cost so it is best to select the smallest size that will accommodate the vehicles you currently weigh yet is large enough to allow you to weigh those larger vehicles that may be in your future. A typical size might be 11 feet wide x 70 feet long but your application may require a longer and / or wider platform. When choosing a platform size, you also need to keep in mind the area in which the scale will be located. Most states require a straight and level approach to the scale on both ends. Normally the length of this approach is 10 feet but it could be more. Add to this the room necessary for the truck to maneuver onto the scale and you could find that 70 foot long scale requiring over 150 feet of real estate. Unfortunately, there has been much confusion when it comes to describing the weighing capacity of a vehicle scale. Actually, when you start to examine competitive models of vehicle scales you’ll find that there are two basic capacity figures, the CLC or concentrated load capacity and the nominal capacity. There may even be other names for capacity used by some manufacturers like section capacity or maximum capacity or so on. Keep in mind that there are only two capacity ratings recognized by the National Conference on Weights and Measures and those are the concentrated load capacity or CLC and the nominal capacity. CLC (Concentrated Load Capacity) The scale’s ability to weigh a load concentrated in a relatively small area on the scale platform. Nominal Capacity The total load that can be weighed on the scale when uniformly distributed over the scale platform. Now that you know the definition for the two types of capacity rating, how much capacity do you need? That is a question that typically is a hot topic among scale manufacturers and there is no simple answer. Begin by taking a look at the trucks that are going to be weighed on the scale. Are they trucks that are going to be weighed within the legal highway load limits (34,000 pounds for tandem axles and 24,000 pounds for a single axle)? If so, you may find that you do not require a larger CLC. On the other hand, will the scale be used to weigh highly concentrated loads common to mining trucks and some dump trucks? If so, a higher CLC rating may be required for your application. Most vehicle scales have capacities ranging from 120,000 pounds to 200,000 pounds. The 200,000 pound level is the maximum nominal capacity for a vehicle scale when using 20 pound divisions because NIST Handbook 44 limits a vehicle scale to a maximum of 10,000 divisions. It is possible to achieve a nominal capacity greater than 200,000 pounds by either using a scale with a 50 pound division or a dual-ranging scale where weights are displayed in increments of 20 pounds up to say 100,000 pounds then in 50 pound increments up to the scale capacity. Generally speaking, however, the 200,000 pound value is more than sufficient for the vast majority of vehicle scale applications. 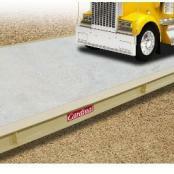 Normally, vehicle scales are available with one of two platform materials; steel or concrete. As with most things, each has its advantages and disadvantages. Although the total cost of a scale with a steel platform is less than one with a concrete platform of the same size, the steel can be slippery when wet and is subject to corrosion. The concrete platform is more expensive and requires finishing labor and curing time, but is not subject to corrosion. Concrete can, however, deteriorate with age and weather. Generally speaking, a concrete deck is a better choice for high traffic applications. Another consideration is that a weighbridge with a concrete deck is much more difficult to move at a later date than a weighbridge of similar size with a steel platform.